McCoy is recovering from a second surgery on his fractured right fibula, Tarik El-Bashir of The Athletic reports. Analysis: The follow-up procedure explains why McCoy was using a cast and crutches this past weekend, more than a month after he was spotted walking without any support. He should still have time to make a full recovery before the start of training camp, at which point he's expected to compete with offseason trade acquisition Case Keenum for the starting job. It's also quite possible Washington adds a rookie quarterback to the competition. McCoy (leg) was spotted with a cast and crutches Sunday, Jim Vertuno of The Associated Press reports. Analysis: McCoy broke his leg in Week 13 versus the Eagles and missed the remainder of the season. He was seen without the help of crutches or a cast in February, so he was assumed healthy. However, he was the grand marshal for a race this past weekend in Austin, Texas, where he was seen sporting crutches again. A quick recovery would benefit the 32-year-old, who will be competing with Case Keenum for the starting quarterback role throughout the offseason program and training camp. McCoy will compete with Case Keenum for the starting quarterback job, Adam Dreyfuss of the team's official website reports. Coach Jay Gruden said he's confident in McCoy's ability, pointing to durability as the major concern, ESPN.com's John Keim reports. "McCoy (has) a great knowledge of the system, he's comfortable with the guys we have, he's a great leader, he's a competitor." Gruden said. "He can run, he can move and he can make all the throws. But he's been hurt and he hasn't done it." McCoy (leg) was recently seen without any support on his recovering leg, Rhiannon Walker of The Athletic reports. Analysis: A fractured fibula planted McCoy on injured reserve for the conclusion of the 2018 season. However, it seems the quarterback has progressed well in his rehab, so much so that it's not a stretch to think he could be fully ready for the start of OTAs this spring. With Alex Smith (lower leg) not expected to play in 2019, McCoy is tentatively entering the offseason as the No. 1 signal-caller on the depth chart in Washington. The Redskins placed McCoy (lower leg) on injured reserve Thursday. Analysis: The transaction is merely a formality, as coach Jay Gruden had already ruled McCoy out for the season finale against the Eagles days earlier. McCoy, who completed 34 of 54 passes for 372 yards, three touchdowns and three interceptions across three games (two starts), is set to become a free agent in March, but Washington may have some interest in bringing him back as a No. 2 quarterback. McCoy (lower leg) has been ruled out for Sunday's game against the Eagles, Kareem Copeland of The Washington Post reports. McCoy (lower leg) won't be available to start Week 17 against the Eagles, with coach Jay Gruden instead electing to stick with Josh Johnson at quarterback, Kareem Copeland of The Washington Post reports. McCoy (lower leg) has been ruled out for Saturday's game against the Titans, Kareem Copeland of The Washington Post reports. McCoy (fibula) was listed as a non-participant on Wednesday's practice report. Analysis: JP Finlay of NBC Sports Washington reports that McCoy was in the locker room Wednesday without a walking boot or brace on his right leg. The 32-year-old quarterback hopes to return for Week 17 or a possible playoff game, but it seems Josh Johnson will get at least one more start Saturday against the Titans. 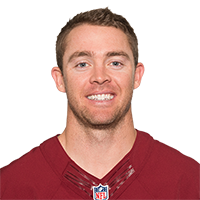 Coach Jay Gruden is "optimistic" McCoy (fibula) will play again this season, John Keim of ESPN.com reports. Analysis: In the wake of Alex Smith's gruesome season-ending leg fractures, McCoy lasted just seven quarters as the Redskins' primary signal-caller before breaking his own fibula. The offense has since cycled through two more quarterbacks, replacing Mark Sanchez with Josh Johnson during a Week 14 loss to the Giants. Johnson is the starter for the time being, but McCoy seems to be a candidate to start Week 16 or 17 if the healing process goes as planned. Coach Jay Gruden admitted Thursday that McCoy will realistically require more than three weeks to recover from the surgery the quarterback underwent Tuesday to address a fractured fibula, JP Finlay of NBC Sports Washington reports. Coach Jay Gruden noted Tuesday that, for now, Washington will refrain from placing McCoy (fibula) on injured reserve, with the hope that the QB could return before the end of the team's season. Analysis: The team's final regular-season contest is Dec. 30, and a return before then seems unrealistic for McCoy. 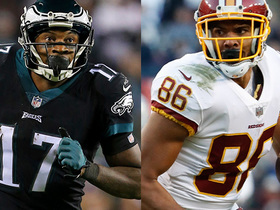 That said, at 6-6, Washington is in the NFC playoff hunt, and if the team qualifies for the postseason, McCoy could re-enter the team's QB mix. McCoy underwent surgery on his fractured fibula Tuesday, John Keim of ESPN.com reports. Analysis: Given that only four games remain on his team's 2018 slate, McCoy probably is done for the regular season. With previous starter Alex Smith (fibula) already on injured reserve, Mark Sanchez is currently the team's only healthy QB. A depth signing (or two) to address the position is therefore imminent. McCoy underwent X-rays after exiting Monday's game against the Eagles and was diagnosed with a fractured right fibula, Lisa Salters reported on the ESPN broadcast. Analysis: As a result, McCoy's 2018 campaign is over only two weeks after No. 1 signal-caller Alex Smith (lower leg) suffered a season-ending injury of his own. Those absences leave Mark Sanchez as the only healthy quarterback on the roster, but the team will almost certainly add another option to the roster by Wednesday. The 32-year-old McCoy faces an uncertain future in the NFL in light of his age and the severity of his injury. McCoy (lower leg) has been downgraded to out for the remainder of Monday's game against the Eagles. Analysis: McCoy will finish the game four of four for 50 yards passing. 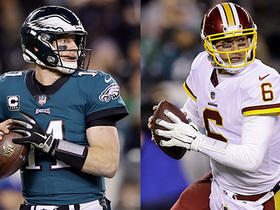 Mark Sanchez will take over under center for the rest of Monday's contest, but if McCoy is out for an extended period, it seems likely that the Redskins will scan free agency in the coming week for either a starting quarterback or a backup to Sanchez. More will be known about the severity of McCoy's lower leg injury in the near future. McCoy is questionable to return to Monday's game against the Eagles with a right lower leg injury. Analysis: McCoy slipped awkwardly in the first quarter before taking a sack and came up limping. He worked with the training staff on the sidelines but ultimately headed to the locker room for further evaluation. Mark Sanchez will take over the Redskins offense with both McCoy and Alex Smith (leg) on the shelf. McCoy completed 24 of 38 pass attempts for 268 yards, two touchdowns and three interceptions during Thursday's 31-23 loss to the Cowboys. He also rushed five times for 28 yards. McCoy completed six of 12 passes for 54 yards and a touchdown while adding 35 yards on five carries after replacing an injured Alex Smith in Sunday's 23-21 loss to Houston. McCoy (thumb) was a full participant at Wednesday's practice, Les Carpenter of The Washington Post reports. Analysis: With a full practice under his belt, it seems likely that McCoy will be available as the primary backup behind Alex Smith for Week 1. A seasoned veteran, McCoy is considered one of the stronger backup options across the league. McCoy isn't on the initial injury report for Sunday's game in Arizona, Josh Weinfuss of ESPN.com reports. Analysis: McCoy dealt with a thumb injury on his throwing hand during the preseason but is apparently fine for Week 1. He's locked in as the backup to Alex Smith. 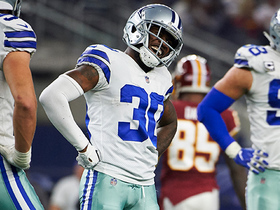 McCoy was absent from Sunday's practice after injuring his right thumb in Friday's game against the Broncos, John Keim of ESPN.com reports. Analysis: McCoy was 3-of-8 passing for 19 yards and was sacked twice by the Broncos defense. The Redskins went out and acquired undrafted free agent quarterback Connor Jessop on Sunday, which could be a move corresponding to McCoy getting injured. As long as the veteran remains out of practice, expect Kevin Hogan to take snaps with the second-team offense. McCoy signed a one-year extension with the Redskins worth up to $7 million, Ian Rapoport of NFL Network reports. Analysis: McCoy is entering the final year of his previous deal, a three-year, $9 million contract he signed in 2016. His extension for 2019 has several clauses that will likely mean he makes less than $7 million if he operates as the backup once again, but the team appears to be content with McCoy as the backup to Alex Smith for the foreseeable future. McCoy likely will stick around in Washington for another season as the No. 2 quarterback, Rich Tandler of NBC Sports Washington reports. Analysis: The Redskins traded for Alex Smith and Kevin Hogan, but they merely swapped sixth-round picks to acquire the latter. While unlikely to beat out McCoy for the backup job, Hogan might convince the team to keep three quarterbacks if he looks good during training camp. McCoy spent the past three seasons backing up Kirk Cousins, who started all 16 games each year. The 31-year-old hasn't thrown a pass in the regular season since 2015 or started a game since 2014. McCoy did not record a single pass during the 2017 season. 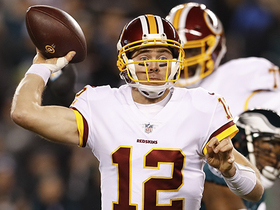 Analysis: McCoy's third season as the Redskins' backup quarterback was his quietest, as the 31-year-old only took the field for one contest, failing to register a pass attempt in the process. Washington now enters another offseason with Kirk Cousins as an unrestricted free agent, leaving McCoy as the most experienced quarterback under contract on the roster. McCoy signed a deal through the 2018 season. 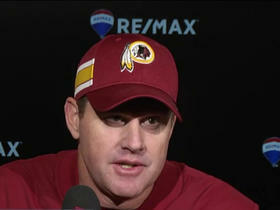 Washington Redskins head coach Jay Gruden gives an injury update on quarterback Colt McCoy and discusses his team's loss to the Eagles on Monday Night Football. Washington Redskins quarterback Colt McCoy leaves the game after sack from Philadelphia Eagles safety Malcolm Jenkins. Washington Redskins quarterback Colt McCoy slings pass to wide receiver Josh Doctson off play action for 32 yards. 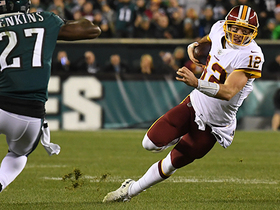 The "NFL Fantasy Live" crew make their bold predictions for the Week 13 matchup between the Washington Redskins and Philadelphia Eagles. 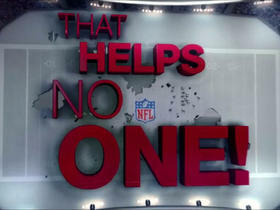 NFL Network's analysts talk about the players that didn't help anyone in fantasy but had a great game. 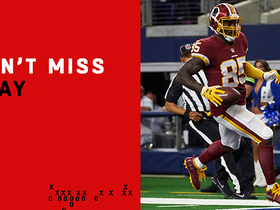 Washington Redskins quarterback Colt McCoy serves up a perfect 53-yard touchdown pass to his tight end Vernon Davis. 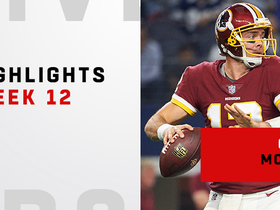 Washington Redskins quarterback Colt McCoy throws two touchdowns in his first game as a Redskins starter against the Dallas Cowboys in Week 12 of the 2018 NFL season. Dallas Cowboys cornerback Anthony Brown sacks Washington Redskins quarterback Colt McCoy for a loss of 7 yards. 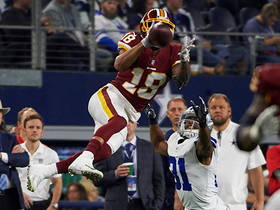 Washington Redskins wide receiver Josh Doctson soars through the air for an acrobatic 17-yard catch on a pass from his quarterback Colt McCoy.